Grade I winner A P Valentine (A.P. Indy–Twenty Eight Carat, by Alydar) was euthanized due to complications from colic Saturday at Park Equine Hospital in Woodford County. 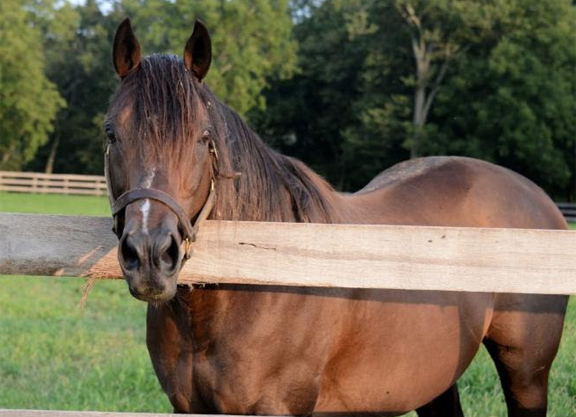 The 20-year-old had been pensioned at Old Friends, the Thoroughbred retirement farm in Georgetown, Kentucky. A P Valentine won the 2000 GI Champagne S. and was second in the following year’s GI Preakness S. and GI Belmont S. while racing for Rick Pitino’s Ol Memorial Stable and trainer Nick Zito. He was retired from racing in 2001, but was soon pensioned due to unresolvable fertility problems.